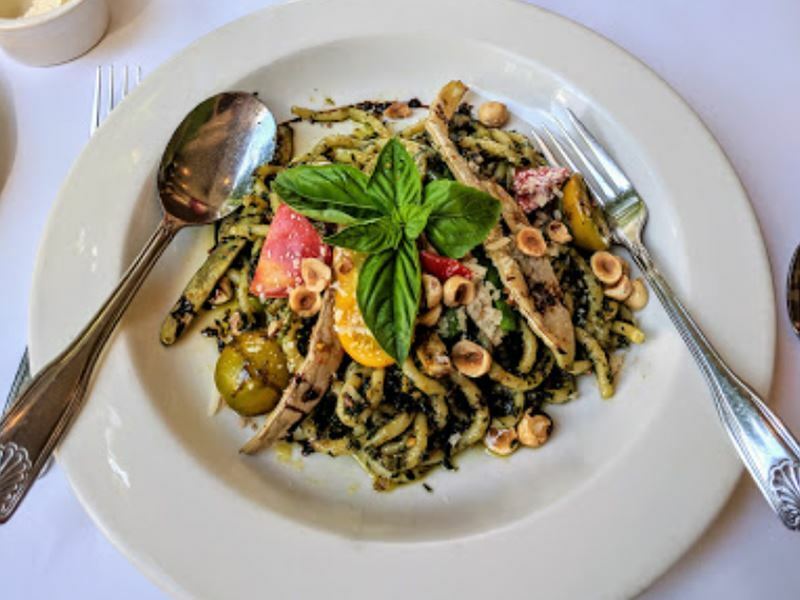 From traditional Italian restaurants that pride themselves on delivering ingenious modern takes on popular favourites to exciting vegan eateries going above and beyond to prove that vegan food is anything but boring, Portland’s dining scene is diverse and constantly evolving. 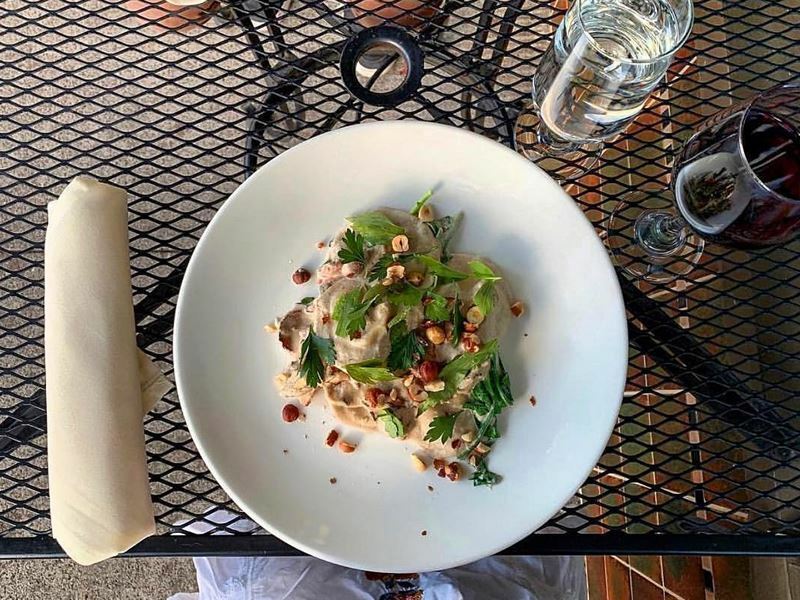 To help you keep up with the latest shining stars and avoid missing out on a single mouthful of happiness, we’ve put together our pick of the top 10 restaurants in Portland, Oregon. 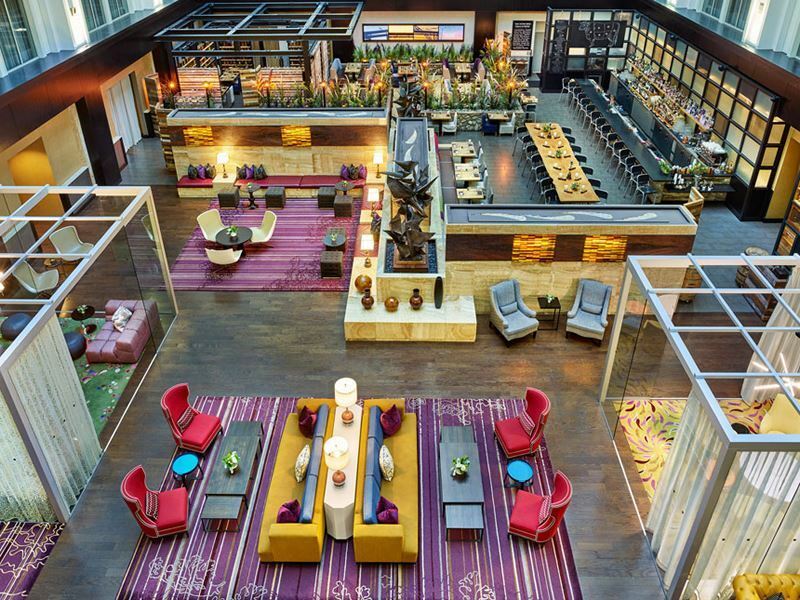 And just like the city’s foodie culture, there’s something for everyone on our list. The scene: Voted one of Portland’s best restaurants by countless online and offline publications, Ava Gene’s is the home of old-world Roman cuisine designed for sharing, family style. The locally sourced and aggressively seasonal menu offers hungry foodies a tempting array of antipasti, housemade pastas and meat dishes. But, refreshingly novel for an Italian restaurant, the colourful, exciting salads and vegetable dishes are what diners rave over. From crisp lettuce leaves tossed with dates, almonds, lemon zest and parmesan to romano beans mixed with turnips, tuna, leafy greens and seeds, these dishes are anything but boring and provide perfect contrasting sides to the hearty Mediterranean mains. Diverging away from the wholesome food rooted in tradition, the decor is bright and contemporary, awash with gleaming marble and firefly-like bulbs that add a touch of the modern era to a restaurant that focuses on time gone by. Signature dish: The daily-changing nature of their menu means there’s no signature dish. But “Family Style” dining is one of the stand-out options the restaurant is known for, comprised of antipasti, starters, two main courses and desserts spread out on the table to be shared amongst groups of 2+. The scene: A long-established upscale venue, Higgins Restaurant & Bar is the place to go for local and sustainably-sourced Pacific Northwest cuisine. Here charming floor-to-ceiling windows create a bright and airy atmosphere in the twin dining rooms, separated by a semi-open kitchen that provides a show with dinner. The artfully crafted menu is a true reflection of the region’s diverse agricultural seasons and the delicious bounty provided by Willamette Valley. From grilled albacore tuna served with garlic crushed potatoes to duck magret and confit, served with port-roasted peaches, their gourmet creations are enticing enough to warrant multiple visits. 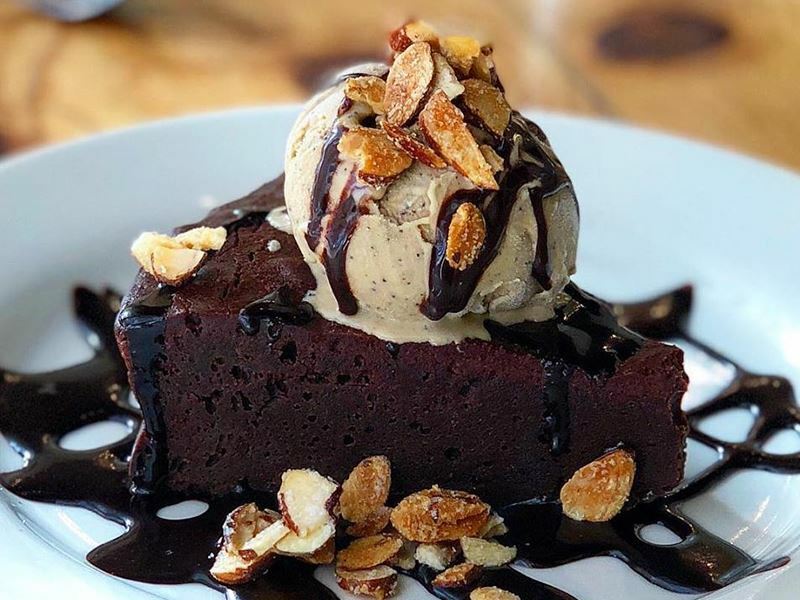 Anyone with a sweet tooth won’t be able to turn down their dessert offerings, laden with delights such as double chocolate fig cake and plum almond tart. While those who prefer a savoury end to their meal will be thrilled with the cheeseboard, charged with local and European selections, alongside seasonal fruits and nuts. Signature dish: Whole pig plate — a Yucatan-style stew made up of achiote-rubbed pork loin, ribs and chorizo, served with tomatoes, chillies, cranberry beans, basmati rice and tomatillo salsa. The scene: A fine dining seafood destination discreetly hidden on the mezzanine level inside the historic Morgan building downtown, Roe curates ever-evolving New American set menus that take full advantage of the best top end ingredients, resulting in highly focused plates that stay true to their flavours. Relying upon expert French and Japanese techniques, the chefs at Roe produce an elegant and surprising dining experience for everyone who walks through the door. The standard four-course prix fixe menu is comprised of a pre-selected list of dishes to choose from. However, the premium Roe experience menu is what attracts most diners to the establishment and encompasses a divinely seasonal seafood-focused tasting menu of seven courses. Butterfish sashimi with truffled white soy ponzu, lobster roasted with coriander and olive oil poached salmon with compressed pear are just some of the dishes you can expect to indulge in. For the ultimate epicurean evening, a caviar service is also available before the main meal, complemented by a carefully crafted selection of superb wine, sake and spirits. Signature dish: Because the menu is constantly evolving, there’s no signature dish at Roe. The scene: A sophisticated farm-to-table dining experience, Urban Farmer focuses on redefining the modern steakhouse by placing a great importance on locally-sourced sustainable ingredients and simple, straightforward preparation. Their drool-inducing menu begins with classic upscale steakhouse starters, such as oysters, beef tartare and seared foie gras, before moving onto the good stuff. Not only can you choose between New York, tenderloin, ribeye and butcher’s cuts in a variety of weights, but you can also go as far as to choose the location where the cow was reared. Delicious steak additions, such as blue cheese-truffle butter and Oregon wasabi creme fraiche make the dining experience even more gourmet. While the focus here is definitely on steak, there are plenty of other options available, from smoked pork loin and roasted chicken to king salmon and Alaskan halibut. Just don’t expect too many vegetarian or vegan options — there isn’t a single one. Signature dish: New York Steak Tasting — 6oz of each: Oregon grass-fed, Brandt prime and Painted Hills 21-day dry aged steak. 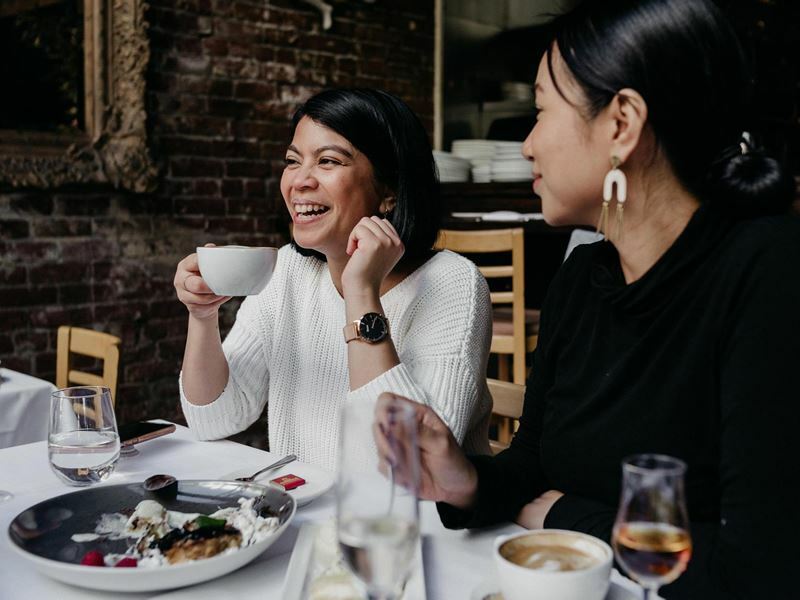 The scene: A French bistro that serves a rotating menu of innovative, exciting dishes, Le Pigeon offers two distinct experiences. You can settle into one of the long communal tables and treat yourself to the five- or seven-course chef’s tasting menu, surrounding yourself with the excited buzz of diners delving into dishes almost too beautiful to eat. Or you can pull up a chair at the bar and order something a la carte. The latter option sounds less tempting, but when you’re presented with a menu boasting the likes of sushi pie with a passion fruit-miso caramel, pork belly with geoduck ceviche and foie gras fajitas with mezcal-pepper jelly, the decision can be a tough one to say the least. With the likes of chocolate tahini tiramisu with blackberry cream and foie gras profiteroles with caramel sauce and sea salt on the menu, adventurous foodies will undoubtedly want to leave room for dessert, and quite rightly so. Signature dish: Grilled Shoyu Pigeon — pigeon confit rangoons served with black beans, peach XO sauce and Chinese sausage. The scene: A lodge-like establishment with a warm and welcoming atmosphere, Nostrana prides itself on creating beautifully simple dishes using honest, local ingredients. The traditionally Italian menu changes nightly, evolving with the seasons and acting as an extension of the best the region’s growers and farmers have to offer. 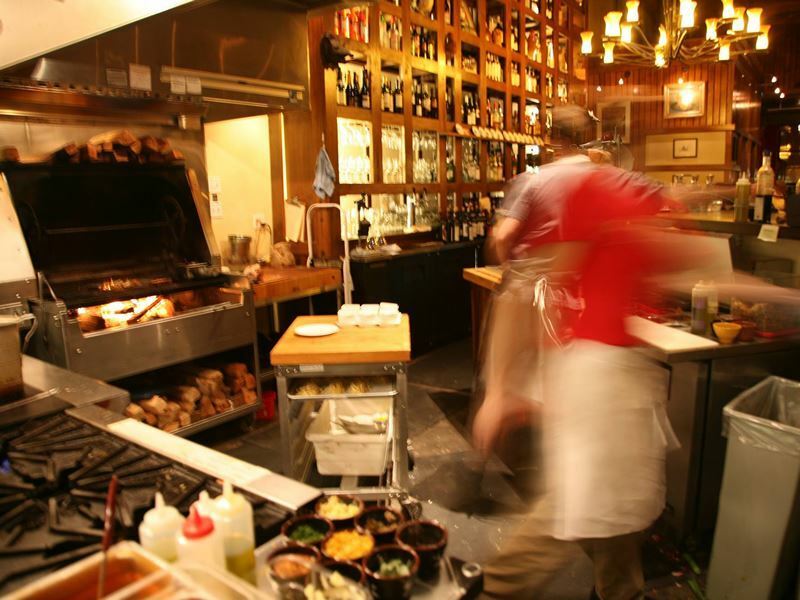 From freshly-prepared soups and decadent charcuterie boards to homemade pastas dressed in heavenly sage butter, pizzas topped with handmade mozzarella and rustic Italian dishes easily on par with anything you’ll find in a Tuscan ristorante, Nostrana more than delivers on everything it promises. Although the ingredients are as local as can be, the wine is sourced a little further afield. Italian classics, available by the bottle and by the glass, grace the menu, along with a wonderful selection of original Italian cocktails. 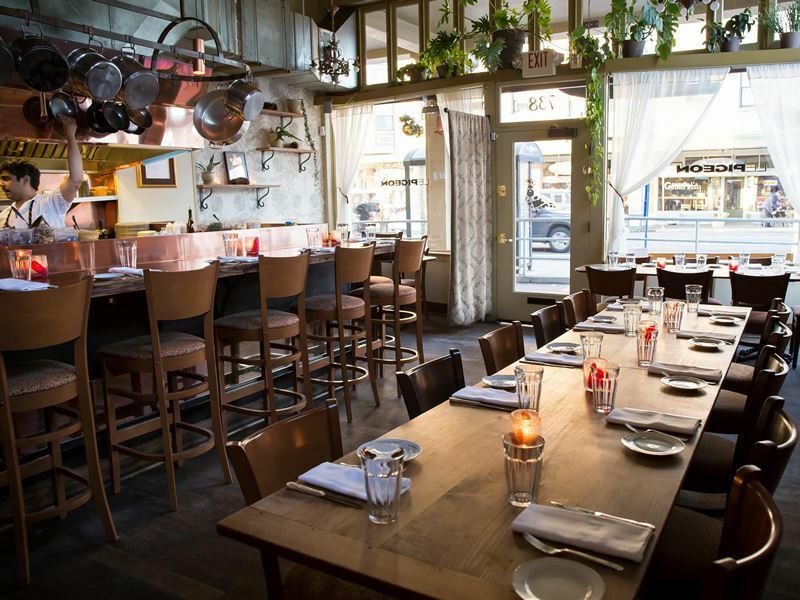 In addition to the classic a la carte menu, Nostrana also hosts fabulous theme nights: Meatball Monday, Gnocchi Thursday and Fish Friday, which are always worth making a reservation for. Signature dish: The menu changes nightly, but there’s always a variation of Bistecca — a 2 ¼lb bone-in ribeye steak grilled to medium-rare and served with a delicious oil, sauce or dressing. The scene: The phrase “just like mom used to make” is never more true than at Mother’s Bistro & Bar. This unique restaurant serves up authentic home-style cooking inspired by the types of dishes mothers from around the world whip up on a regular basis. The evening menu is filled with comfort food-style eats such as chicken and dumplings, macaroni and cheese, and steak frites. But what really gets people queueing outside the door is the breakfast. Brimming with enchanting plates of pork-apple sausage and cheddar cheese scramble, cornflake-crusted French toast with maple syrup and Belgian waffles with whipped cream, everything sounds so good you’ll want to order it all. And with Mother’s Bistro & Bar offering half portions of all the dishes, you’re one step closer to being able to do just that! Signature dish: Mom’s Meatloaf & Gravy — homemade meatloaf made with natural Angus ground beef and sauteed aromatic vegetables, served with gravy, smashed potatoes and seasonal vegetables. The scene: A chef-driven restaurant that specialises in hyper-seasonal food, Q Restaurant & Bar gets its inspiration from the diverse backgrounds of its staff and the fresh ingredients supplied by local farmers. This allows the team to offer an ever-changing and unique variety of dishes, guaranteeing a new experience with every visit. 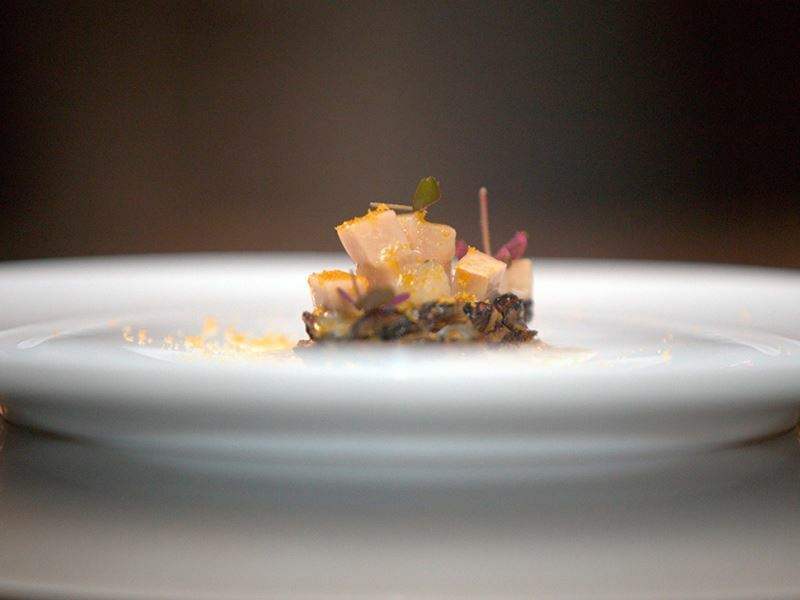 While the menu changes constantly, the theme is reliably a modern take on Pacific Northwestern cuisine, presented in such a creative and imaginative way that you’ll struggle to take a bite for fear of ruining the appearance of the dish. The a la carte menu is comprised of small plates, such as house-made rabbit pate with prune jam and duck confit spring rolls with wasabi, followed by hearty main courses like osso bucco with a parmesan risotto and housemade squid ink spaghetti with local tomatoes. But most diners make reservations for the iconic Chef Annie’s tasting menu, composed of the dishes the head chef is most proud of. Signature dish: Since the menu changes every evening at Q Restaurant & Bar, there’s no signature dish. The scene: Successfully turning the notion that vegan food is nothing but dull salad leaves on its head, Blossoming Lotus Portland delivers sublime vegan fusion cuisine in a stylish, unassuming setting. 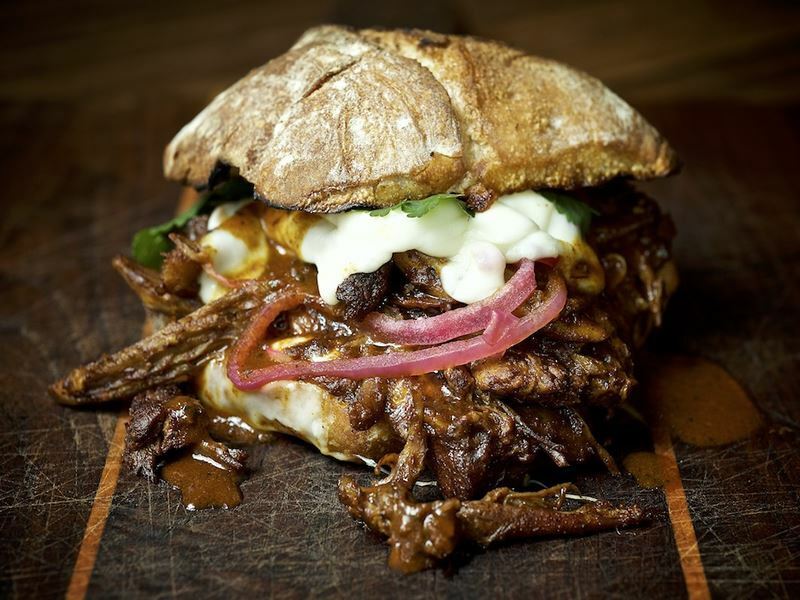 Each item on the menu boasts an interesting combination of ingredients, flavours and textures sure to leave even the most dedicated carnivores curious and hungry. Breakfast and brunch take the form of sweet cinnamon rolls with cashew cream cheese and veggie-packed scrambles made egg-free by using tofu, all ready to be washed down with a superfood smoothie, fresh juice or classic cocktail. The deliciousness continues into the lunch and dinner menus, with lentil “cheese” burgers smothered in roasted garlic aioli and nutrient-packed green bowls filled with plenty more than your five-a-day. The decadent desserts, ranging from classic strawberry cheesecake to the more innovative peach blueberry hazelnut crisp are so remarkable you’ll never believe they’re entirely egg- and dairy-free! Signature dish: Live Nachos — spicy live chips topped with nacho cheese sauce, pecan chorizo, tomatoes, onions, scallions, avocado, cashew sour crema, fresh coriander and a drizzle of lime juice. 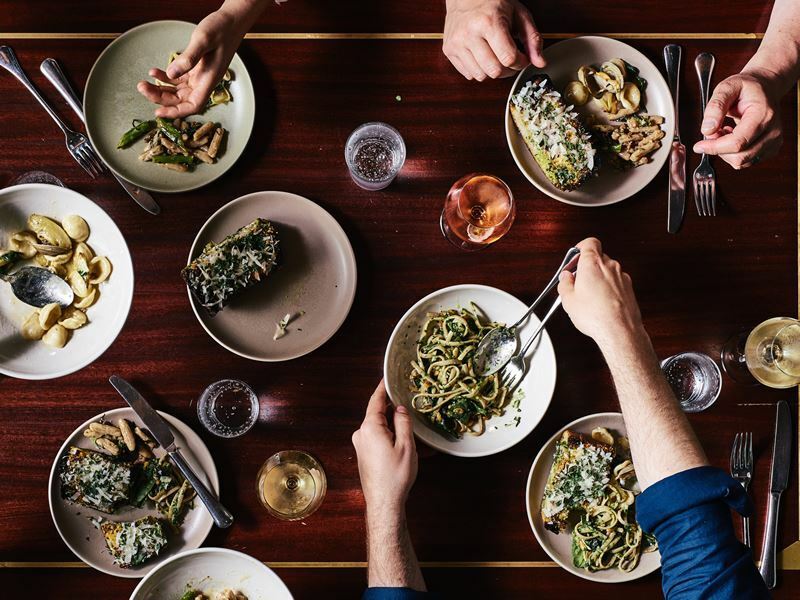 The scene: An intimate and authentic restaurant in an unlikely downtown setting, Mucca Osteria is the marvellous creation of chef-owner Simone Savaiano who left his home in Rome to set up a traditional Italian restaurant in Portland. 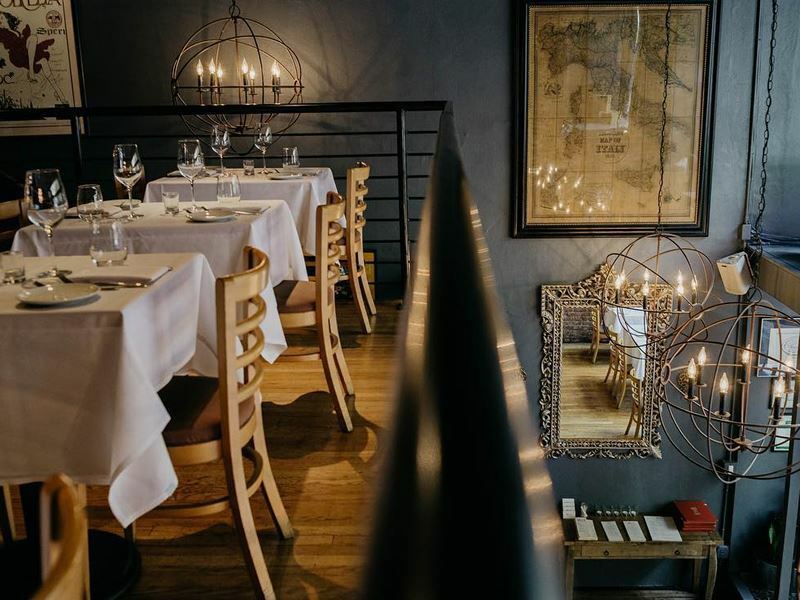 The bare-faced brick walls, simple wooden seating and delicate linen tablecloths have the air of a rustic dining room in Tuscany, but the masterly artistic presentation of the dishes reveals that you’re somewhere much more grandiose. Pairing originality with tradition, while maintaining sustainable practices and working with local organic farms, Mucca Osteria’s menu is continuously evolving according to the seasons. Choose from classic antipasti, such as buttery sea scallops or wafer-thin beef carpaccio to start then follow it up with one of the enticing homemade pastas, swirled with pancetta, asparagus and ricotta. Although somewhat limited, the main courses are truly divine, with the likes of sous-vide sirloin with a red wine sauce and pan-roasted duck breast with seasonal mushrooms all vying for your attention. If you’ve still got room, indulge in a classic espresso-loaded tiramisu or lusciously creamy pannacotta for the perfect sweet end to a gourmet experience. Signature dish: Pappardelle al Cinghiale — egg pappardelle pasta, topped with a slow-braised wild boar ragu sauce.